Hardware systems for generating MIDI output from guitars are often expensive, impractical and unreliable. Jam Origin's revolutionary software alternative is none of these things. MIDI guitar: two words that give voice to the hope and despair of my age‑long quest to find a guitar‑led route to the world of synths and samplers. Along the route, some fine products have come my way, but none has quite cut the mustard. From the long list of the fallen, I have fond memories of the pioneering ARP Avatar and, in particular, of the Zeta Mirror 6 guitar, which combined fret‑scanning, capacitive touch‑sensing and pitch extraction to drive external MIDI synths with around 4ms latency via its companion Synthony rack unit. Despite the disappointments, guitarists like me who wanted to record into our MIDI sequencers without wrestling with keyboards soldiered on, spending our hard‑earned cash with manufacturers who tried their best to cater to our needs. The early approach of pairing dedicated guitars with interfaces evolved fairly swiftly into the series of guitar‑neutral, one‑box systems with integrated MIDI converter and synthesizer, driven by proprietary hexaphonic pickups. The latest incarnation of this design from Roland dominates the sector today. Over the years, a number of small companies have developed specialist polyphonic guitar‑to‑MIDI converters, but they have typically been too expensive to have mass appeal, and all have seemingly fallen by the wayside. 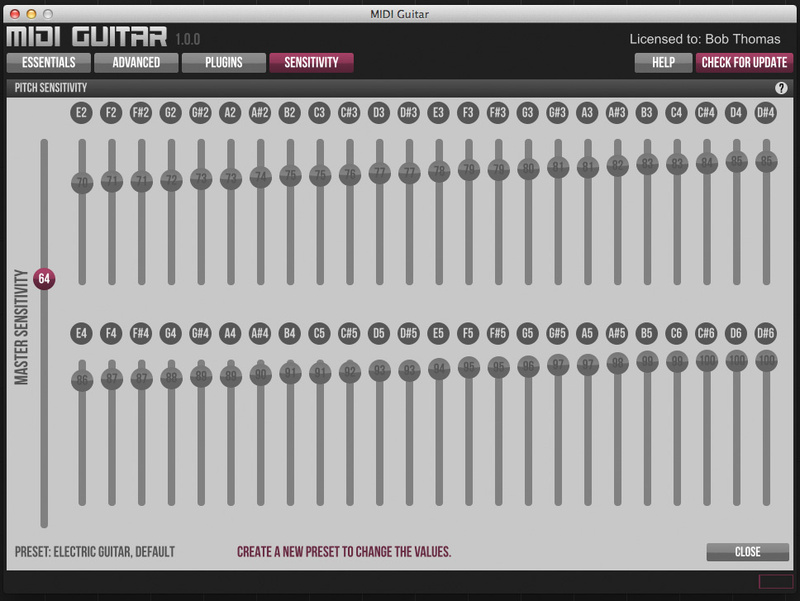 As a result, The desktop version of MIDI Guitar is the most configurable, thanks to the options on the Advanced setup page. what we have been left with in terms of dedicated guitar‑to‑MIDI hardware are either monophonic pitch‑to‑MIDI converters or the spiritual successors of the Synthaxe ­— ie. guitar‑shaped objects that can output MIDI. Now, however, the prodigious processing power of present‑day personal computers is coming to the rescue, by moving the focus of guitar‑to‑MIDI conversion away from specialist hardware and into the world of interfaces and software. The actual patent application (Generative Audio Matching Game System, US 20120132057 A1) makes very interesting reading, and sets out the methodology that lies behind the polyphonic pitch prediction and detection within MIDI Guitar. In extremely simple terms, it would seem that incoming audio from a source is compared against a stored library of pitches from that source, and the matches arising identify the pitches which are then translated to MIDI. As the title might suggest, the patent application also sets out the potential usage of the technology within a computer 'edutainment' game based around the concept of a jam session, and I'd certainly look forward to seeing that if it ever turns up in the real world. Meanwhile, however, Jam Origin claim that MIDI Guitar is the world's first low‑latency, polyphonic software that can turn any guitar with a pickup into a polyphonic MIDI controller. What really sets MIDI Guitar apart from its competition is that there is no need for any specialised hardware: all you need is a way of recording the output from your guitar's pickup into your computer. 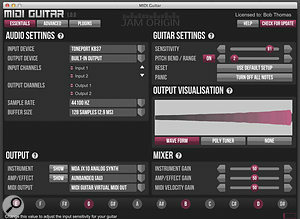 MIDI Guitar runs on Windows (XP SP3 or newer), Mac OS (10.6 or newer) and iOS (iPad 2, iPhone 4S, iPod Touch 5 or newer). All variants are available as virtually unrestricted free trials, with the Windows and Mac versions being downloadable from the Jam Origin web site, whilst GarageBand (for Mac OS) and iOS variants are available on the Apple App Store. Installation under Windows and Mac is as simple as downloading and extracting the software, dragging the resulting folder into your Programs or Applications folder and manually copying the VST '.dll' files and the AU '.component' files to the necessary plug‑in folders. 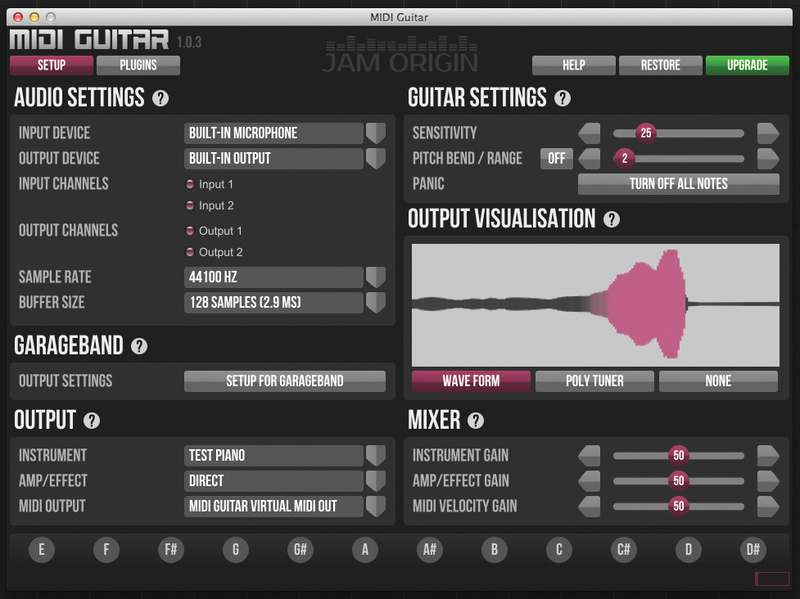 The desktop trial versions are fully functional MIDI Guitar for iOS is a simple but surprisingly effective app implementation of Jam Origin's technology. except for occasional interruptions to the MIDI and VST/AU operation. Installing and fully activating the iOS version of MIDI Guitar on my iPad 2 was as easy as I've grown to expect from the App Store. Opening the program brings up five information pages, three of which tell you all need to know about the app and how to run MIDI with other iPad apps and GarageBand. The other two pages show cable and Wi‑Fi MIDI connection graphics. Cabled MIDI via an iOS MIDI interface linked to your computer, synth or sound module is recommended as the route with the least latency. However, as Macs have built-in Wi‑Fi MIDI support and there are third‑party apps for that purpose available on the Windows platform, MIDI over Wi‑Fi is an option if you want to avoid trailing wires; you can minimise the actual latency by running a network cable from your router to your computer. Being the simplest incarnation of MIDI Guitar, the iOS version also has the least degree of display and control. You can set polyphonic or monophonic mode, switch the latency between 6ms and 11ms and alter the input sensitivity to suit your guitar's output and your playing syle. A bargraph displays the input level, and you can route the MIDI output to the inbuilt Test Piano sound, to the Virtual MIDI Out or, via the Network Session 1 option, to Wi‑Fi MIDI. The GarageBand version is a step up in complexity from the iOS app, with the ability to select from any available input and output audio devices and channels. Sample rate can be varied from 44.1 to 96 kHz and buffer sizes between 128 samples (2.9ms latency) and 512 samples (11.6ms). If you wish to run in stand‑alone mode, you can choose the output sounds from a range of built‑in pianos and synths, add additional software instruments via AU plug‑ins, add AU amps and effects and route the MIDI output as in the iOS app. A single button‑press configures the outputs for GarageBand, disabling the Instrument and Amp/Effects sections and routing the MIDI to GarageBand via the Virtual MIDI Out. A MIDI Pitch‑bend On/Off switch and Range control are added, as is an 'all notes off' Panic button. 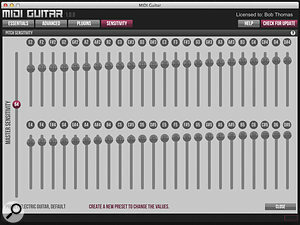 An Output Visualisation facility gives you a view of either the waveform of the input from the guitar or the Polytuner, in which the pitches of each of the recognised strings are displayed on a series of rotary dials. For those who might find such complexity distracting, these visualisations can be switched off. A line of buttons across the bottom of the page illuminate to indicate the pitches being recognised, and can also be clicked on to generate the indicated pitches. The control complement is completed by level faders for a three‑channel mixer. As well as balancing the audio levels of the Instrument and Amp/Effects outputs, you can also adjust the gain of the MIDI velocity. The additional Plugins screen carries the Plugin Manager where you can add, remove and scan for AU plug‑ins on your computer. 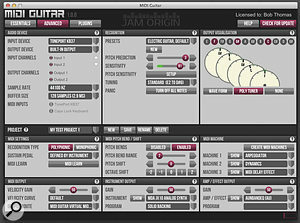 In the Windows and Mac desktop versions, MIDI Guitar can run either as a stand‑alone application hosting VST or Audio Units instruments and effects, or as a plug‑in itself in VST or Audio Units format. 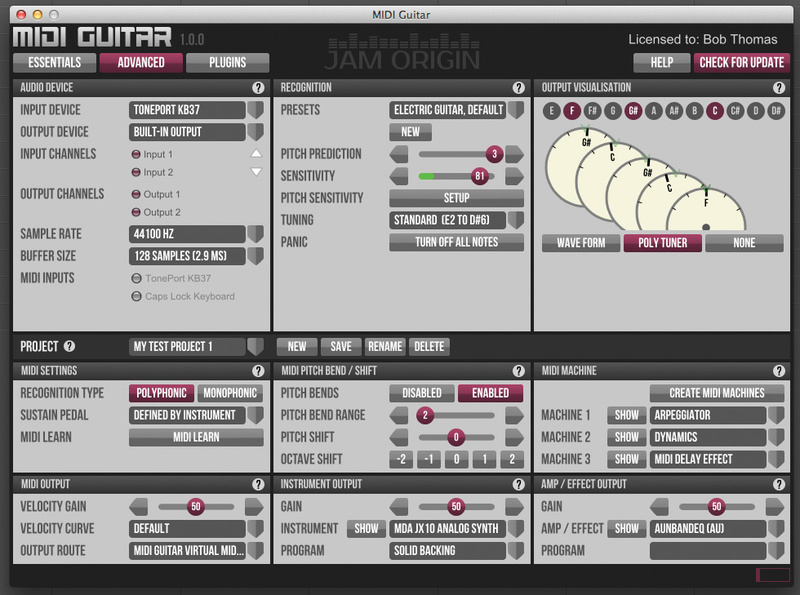 As most guitarists probably would, I began by approaching MIDI Guitar as a virtual instrument, though Jam Origin suggest that we think of MIDI Guitar primarily as a DAW plug‑in. 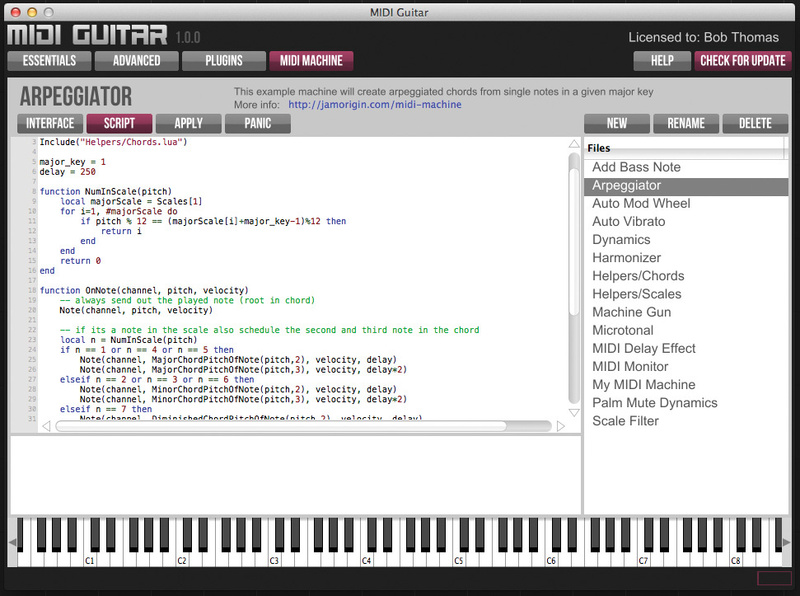 Either way, the desktop version is the most fully featured incarnation of MIDI Guitar. Its Essentials screen is almost identical to the GarageBand Basics screen except that the GarageBand default selector has disappeared and there is now an additional button that resets the program's Recognition preset (see below) to 'Electric Guitar Default'. Working on this screen is, other than that, the same as working on the GarageBand version. The Advanced screen is where you'll find the additional editing and setup facilities that, to me, give MIDI Guitar its real power. If you're going to get the program to really work for you, this is where you'll be spending most of your time. In the Audio Device section, you'll see a drop‑down list of available MIDI Inputs, any or all of which can be routed in to merge with the guitar‑generated MIDI stream. This gives you not only the ability to use a floor controller to send MIDI controller information into MIDI Guitar via its Learn function, but also to use a keyboard to play the selected instrument in MIDI Guitar. The neighbouring Recognition section gains four new facilities in addition to the Sensitivity and Panic: the ability to set the level of Pitch Prediction, with the highest (and recommended) setting giving the lowest latency; the facility to adjust sensitivity individually for each note in the four‑octave recognition range, as well as to increase or decrease the overall sensitivity; the ability to move the lowest recognised note to E2, D#2 or D2, which accommodates drop‑D tuning, but at the expense of dropping the highest recognised note to C#6; and For Mac OS users who want to keep things simple, the GarageBand version of MIDI Guitar offers much of the app version's simplicity. the ability to save all the settings in this section as a snapshot simply by creating a new preset. The top half of this screen is completed by the Output Visualisation section, which now carries clickable note buttons. A bar across the middle of the screen carries the buttons and display that enable you to store and recall all the settings across the two three‑segment rows beneath it. The first of these rows is all to do with MIDI parameters, with its first section, MIDI Settings, selecting polyphonic or monophonic pitch recognition, choosing whether CC64 acts as a synth sustain pedal or acts to hold the synth sound behind the guitar sound, and activating the MIDI Learn function. The second, MIDI Pitch‑bend/Shift, adds a two‑octave shift either way to the familiar pitch‑bend controls. The MIDI Machine section allows the creation and selection of what could be thought of as customised MIDI effects. A MIDI Machine can be mapped to any MIDI input or output sequence, allowing you to develop and insert customised arpeggiators, harmonisers, MIDI delays, and so on. Customisation at this level needs a certain level of programming expertise, and the MIDI Machine API is based around a total of 10 Lua functions. Lua (www.lua.org) is a powerful programming language that is already used in many applications such as Adobe's Photoshop Lightroom, and is extremely fast. What makes this section particularly attractive (to me, at least) is that it acts on any MIDI stream passing through it, so a MIDI Guitar MIDI Machine can work on the outputs of external keyboards and sequencers. If you like the sound of this, you can find the API details at http://jamorigin.com/products/midi-machine. The last row on this Advanced screen deals with all the output functions, pulling together the Output and Mixer sections and dividing those into MIDI, Instrument and Amp/Effect sections. In this version, the MIDI Output has four selectable velocity curves. The Plugins screen operates in exactly the same way as in the GarageBand variant, but this time it can catalogue both VST and AU plug‑ins. 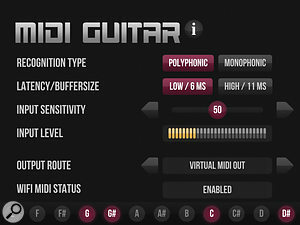 Getting started with the iOS version of MIDI Guitar is simplicity itself: you simply plug in your interface and play. Although Jam Origin openly state that the latency in the iOS version is inferior to that of the desktop versions, I could find nothing to complain about in the performance of MIDI Guitar under iOS. Using an IK Multimedia iRig Pro as the interface with MIDI Guitar in stand‑alone mode at the lowest latency, tracking and triggering were essentially flawless and felt extremely natural. The latency, whilst just noticeable, never felt as though it was hindering the music — perhaps because it was, as far as I could tell, exactly the same across all strings. As might be expected, MIDI Guitar worked easily and seamlessly with the iOS version of GarageBand. With GarageBand running, I found that I got the best results from virtual instruments by running at the higher latency, and although that latency was more noticeable, the overall excellence of the tracking and triggering still impressed me. The full desktop version can run as a stand‑alone program hosting VST or Audio Units virtual instruments. As always, time spent setting up the sensitivity to work with the way that I was playing a specific sound paid dividends. Setting up Wi‑Fi MIDI between my iPad and my Mac was a painless process (mostly thanks to the detailed instructions at www.beatsurfing.net), with the iPad's MIDI Guitar MIDI channels turning up immediately in Logic's Library. It couldn't have been easier. However, as Jam Origin recognise, there are issues with latency when sending MIDI over Wi‑Fi, aspects of which are outside their control. The overall latency will depend on the performance of your router and on whether or not you have a cable running from it to your desktop computer. Jam Origin currently anticipate that iOS users will experience a note‑pluck‑to‑Mac latency between 30 and 60 ms, with anything over that being down to the performance of the user's system. The non‑tablet flavours of MIDI Guitar require a modicum of setting up before you can start playing. For the GarageBand and desktop variants, once the program has opened, you need to plug in your guitar interface, select it as the input, select the output that you're going to monitor through, select the Test Piano and adjust the Sensitivity level until you're getting clean notes. Depending on your computer's performance, you may need to increase the latency from 128 to 256 samples at this stage. In stand‑alone mode on my 2011 iMac and my Vista and Windows 7 PCs I found that I could stay at 128 samples quite happily, unless I was using certain third‑party plug‑ins, when moving to 256 samples cleared up any problems. Once you get used to working with them, the performance across all three versions is extremely impressive: at the very least, equivalent to my current hardware solutions, even before I got into some in‑depth optimisation on the desktop Advanced tab. One of the issues with using a guitar to play a non‑guitar sound realistically is that the sound itself can lead you to play in a non‑guitaristic fashion. This is where MIDI Guitar's Pitch Sensitivity and Pitch Prediction functions let you optimise individual note sensitivity to great effect. The thing to remember here is that you don't have to set up every single one of the 48 notes: you only need to work on notes that you are actually going to use. If you're playing an A-minor pentatonic scale, you don't need Sensitivity can be adjusted on a per‑note basis, which can be very helpful for cleaning up your triggering, especially if your parts aren't fully chromatic. that many notes to work perfectly, especially if you're staying within one octave for the part. The ability to optimise just the needed notes (and turn off all the rest), then save that configuration as a preset is a really great feature, and can completely cut out false triggering of unwanted notes. Both as a stand‑alone program and as a plug‑in, I found that MIDI Guitar worked without fault. The Virtual MIDI Output was completely rock solid, recording absolutely clean MIDI information that required almost no editing, other than to correct for my sloppy playing here and there. I ran it, without difficulty or incident, with GarageBand and Logic on the Mac and, once I'd installed a Windows virtual MIDI driver, with Studio One on the PC as well. Since Jam Origin have thoughtfully provided a comprehensive list of setup guides for the vast majority of common DAW programs on their web site, plus general setup notes to cover any DAW that is not on the list, I really can't imagine anyone having problems. For me, latency on the desktop incarnations of MIDI Guitar just wasn't an issue. As I've mentioned before, Jam Origin state that the program's latency is comparable to that of hardware units, but what sets MIDI Guitar apart is that the latency is the same across all strings — something that I haven't experienced since the long‑gone days when I owned my Zeta Mirror 6. There just isn't the room in this review to go through all this program's stand‑alone and DAW functionality in the detail that it deserves and so, if MIDI Guitar piques your interest, I'd urge you to download the trial versions and delve into it in detail. There are numerous YouTube videos of guitarists and beta‑testers putting MIDI Guitar through its paces, and you'll learn a lot from them about the program's power. The success of any MIDI guitar system, hardware or software, is defined by its tracking and latency performance. By that measure, when set up and optimised for a particular sound and my playing style, the desktop version of MIDI Guitar succeeds beyond anything I have played to date. I felt that the desktop version could be set up with my Strat to track better than anything that I've ever owned — it's even better than a perfectly set up Zeta Mirror 6. Overall, the MIDI latency was at least as low as my current hardware floor unit, and that particular unit, compared to MIDI Guitar, has much higher latency on the lower strings. I'm also very encouraged The icing on the cake is the MIDI Machine section, where Lua scripts can be implemented to process incoming MIDI data. by my interactions with Jam Origin themselves, who display real commitment and enthusiasm. There's a major upgrade to the iOS version of MIDI Guitar coming out soon and it seems that they are also currently working on some really interesting enhancements to the desktop versions. Bass and violin versions are also in the works. I can't wait! 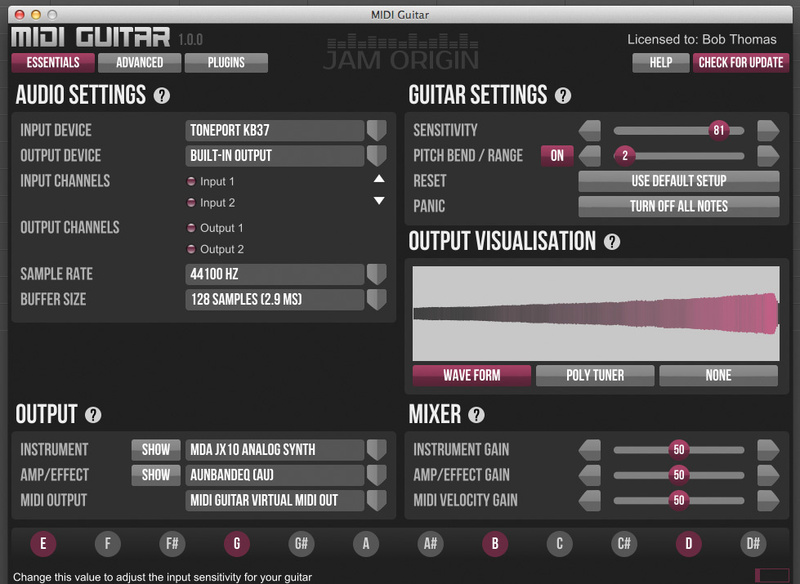 Even if you do end up with a millisecond too much latency or a glitch here or there, the absolutely killer aspect of Jam Origin's MIDI Guitar program is its price. I just can't think of any reason, save prejudice or poverty, why a computer‑owning electric guitarist who wants to experiment or simply needs to transcribe his or her playing wouldn't buy this program. 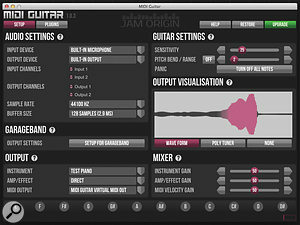 If you're a guitarist who owns a computer or iOS device and an audio interface, Jam Origin's MIDI Guitar is an essential trial download and an inevitable purchase. Go for it! Before you get started with MIDI Guitar, you'll need to get your guitar tuned to concert pitch — or a maximum of one tone down, in the desktop versions — turn all controls to 11 and select the bridge pickup. Jam Origin are up‑front about stating that no real‑time audio tracking will ever be perfect, as there will always be some latency (zero latency would mean detecting a note before it is played!) and that accurate note triggering depends on the way that the guitar is played. I'd also advise making sure your strings are in good condition, slipping a thin strip of felt under the strings at the first fret to reduce any false triggering, and not using effects or playing through an amplifier. Jam Origin advise against using an acoustic guitar as the source, but I found that an under‑saddle pickup worked perfectly satisfactorily. As an aside, selecting the computer's internal microphone and simply singing notes produced some interesting chordal structures, but perhaps that's just my singing. My sense is that any pitched source operating within the program's four‑octave range is going to give interesting results, some of which may be more useful than others. Patent‑pending, highly robust pitch extraction. Capable of extremely accurate tracking. Low latency at least equivalent to current hardware units. Given its inventor's enthusiasm, it's going to get better and better. An unbelievable price point for this level of performance. If you don't have a suitable guitar‑to‑computer audio interface, you're going to want to buy one. 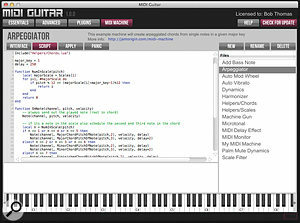 MIDI Guitar is an amazing program that opens up the world of MIDI to guitarists without needing proprietary hardware to deliver an astounding level of performance. It is able to run on PC or Mac not only as a stand‑alone host for VST and AU instruments and effects, but also as a VST and AU plug‑in. 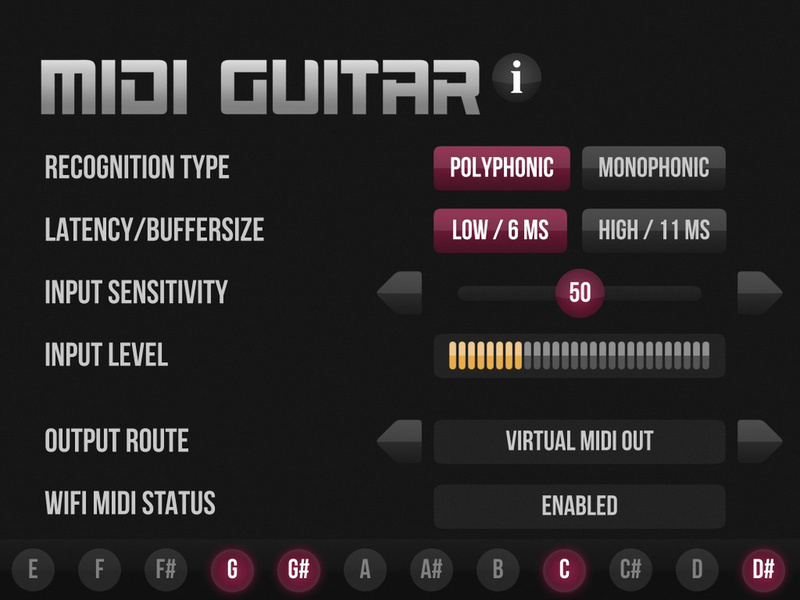 Together with its iOS implementation, MIDI Guitar opens up a whole new area of experimentation at a price point that is simply unchallengeable. The future of MIDI Guitar starts here! Full desktop version $99.99; GarageBand version $39.99; iOS version $19.99. Desktop version 1.0.0; GarageBand version 1.0.3. Apple 27‑inch iMac with 2.8GHz Intel Core i5 CPU and 20GB RAM, running Mac OS 10.9.2. HP Pavilion laptop with 2.27GHz Intel Core i5 CPU and 3GB RAM, running Windows 7 Home Premium. HP S3821 desktop with 2.5GHz dual‑core Intel Pentium CPU and 3GB RAM, running Windows Vista.